Syracuse University recently ranked 25th among the top 30 green power colleges and universities in the country. The list, complied by the U.S. Environmental Protection Agency, ranks the top university green power purchasers—universities that use electricity generated by renewable resources. 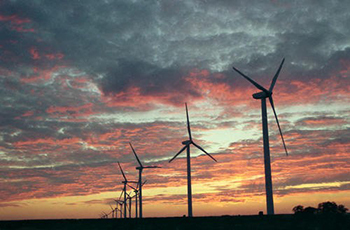 Syracuse University has been purchasing green power, such as that from wind farms, since 2005. Syracuse University has been purchasing 20 percent green power since July 2005, says Nate Prior, associate director of energy conservation in Energy Systems and Sustainability Management. At the time of the purchase in 2005, SU was recognized by the EPA as the second-largest university buyer of green power. In the past few years, energy sources used to create electricity have grown in variety, but the United States continues to generate most of its electricity from fossil and nuclear fuels—forms that have proven dangerous to human health and to the environment, according to the EPA’s website. Advances in environmental awareness and in technology have allowed electricity markets to expand their renewable offerings. Electricity is now being generated by renewable sources, including solar, wind, geothermal, hydropower and biomass. These sources can be used on small and large scales, and are being utilized by the University. SU currently purchases 22,900,000 kilowatt-hours (kWh) of green power, representing 20 percent of the University’s annual electricity usage, by purchasing Green-e certified wind renewable energy certificates, which help reduce the environmental impacts associated with campus electricity use. The University continues to expand its knowledge of utilizing renewable resources on campus through feasibility studies and pilot projects, Prior says. One example is the installation of 40 solar thermal systems on South Campus apartments that collect solar energy to heat the water in these apartments. SU has a long history of energy conservation, says Prior. In 2007, SU became a charter signatory of the American College and University Presidents Climate Commitment (ACUPCC), making SU one of the largest private universities committed to zero net greenhouse gas emissions. This commitment will be fulfilled through the University’s Climate Action Plan (CAP), an institutional blueprint and timeline for SU to become climate neutral by 2040. The CAP consists of five overlapping sustainable components focused on energy conservation through existing technologies; energy efficiency through emerging technologies; creation of energy from renewable sources; enhancing sustainability practices among students, faculty and staff; and limited use of energy offsets, as needed, that benefit local residents and businesses. “Being recognized by the EPA as a top 30 university validates the University’s continued focus on enhancing campus sustainability and reducing the University’s carbon footprint,” Prior says.